Bob's Blog - Live from Lewisville: Marinelli Report - Where Do You Begin? In a similar fashion to how we follow the offense on Tuesdays in this space, I also try to offer up some strategic observations and discussions on Wednesdays here in what we call the Marinelli Report. This is a bit more difficult, because defense is a reactionary element of football rather than offense where you set the narrative with your own ideas. On defense, you are attempting to prevent the opposition's ideas and plans from working. It is destructive, not creative, in theory. That means we must follow it in a different way. We cannot always track things on the same obvious trail of development here like we can with the offense. The defense is asked to deal with many different types of attacks where one week they go down one trail, and the next week they must figure something completely different out. It requires the ability to be versatile and prepared for whatever is thrown at them (or run). One of the many helpful items we track here from week to week continues to focus on the blitz rates of the Dallas Cowboys. Right now, the Cowboys rank amongst the most conservative defenses in the NFL. This is a direct reflection of the value system of the person who calls their defense. In fact, it is interesting to see how incredibly conservative they have gone after being coached by 2 of the most aggressive defensive coordinators in the NFL in the last decade. Rob Ryan would unleash blitzes when you would least suspect them to try to zig when you would zag. His overall blitz totals were high, but not uncommonly high - because his total blitz number would remain within the boundaries because he would blitz when you expected nothing and would do nothing when you expected a blitz (in general). 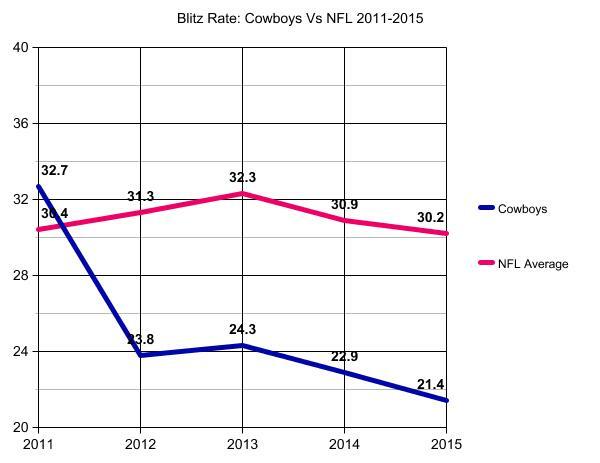 As you can see above, since 2011, the Cowboys have stopped blitzing. By the way, Rob Ryan was the DC back in 2011 and 2012. Then, 2013 was Monte Kiffin, with Marinelli grabbing the reins in 2014 and 2015. So, again, 1,000 snaps of which about 600 are pass plays every year. So, the Broncos are bringing heat on over 250 of those plays. 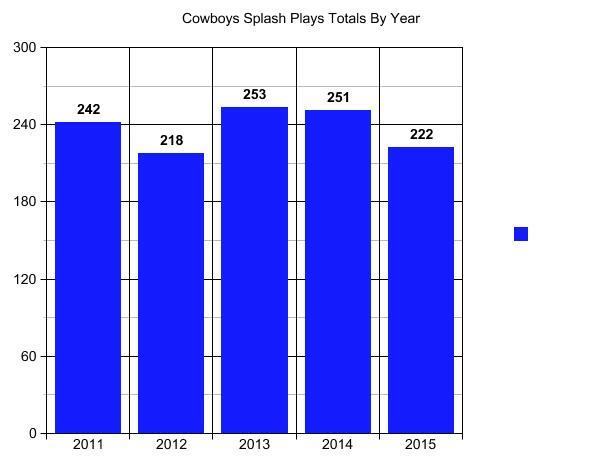 The league average team is blitzing on about 180 of those plays, and the Dallas Cowboys blitz roughly 125 times. Or, 8 times a game. I am not here to say that is wrong or right. It just is. This Dallas defense would be considered about as conservative as they come. In other words, you won't find very many (if any) teams that blitz less than Rod Marinelli. "Get there with four" is his mantra, and he believes it with all of his heart. And by the way, it doesn't seem to be talent-based. He would likely feel the same way with Von Miller and DeMarcus Ware. The league is now in nickel about 70% and the Cowboys have actually gone higher than that when they had Scandrick healthy. Also, in 2014, they were ahead so much that the opposition was passing more and the Cowboys adjusted. It went down last year because the Cowboys were behind a ton and had to deal with teams trying to run out the clock, so you add another LB to try to slow that idea down. As offenses go more and more to 11 personnel (3 WR-1TE, no fullbacks), defenses adjust. 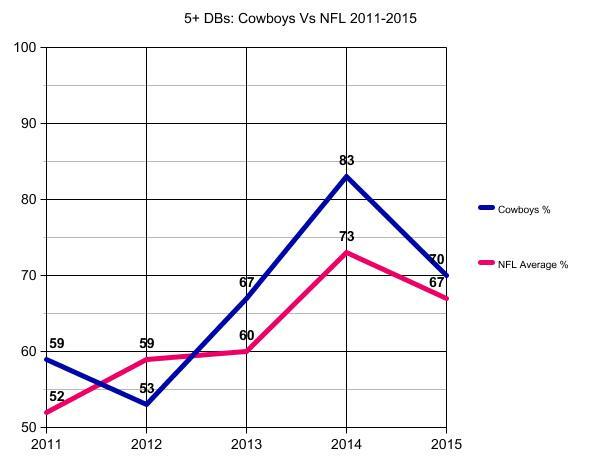 The Cowboys actually play dime defense about 60% as often as they play "base". That means we must change what we call "base" defense. It isn't a 4-3. The base defense - when you are playing it more than any other, is absolutely a 4-2-5 in Dallas and most places around the NFL. This is helpful to know for any fan because this is why you always need corners in the draft and on your cap. This is why you don't rush to cut a corner who has a contract you don't love. Brandon Carr plays 1,000 snaps for you and you need corners who can do that and not get exposed every week. 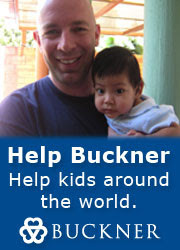 I wrote a helpful (hopefully) report on this recently that I would invite you to read by clicking here. 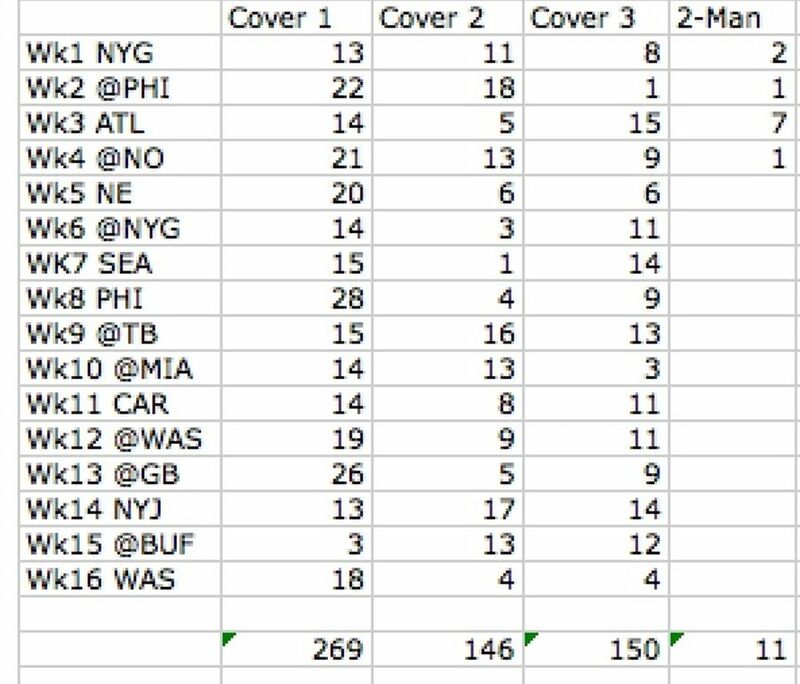 Every week, we want to discuss coverages and what they all mean and how they work (At least on a simplistic level so that everyone can follow along), but I probably shouldn't recycle it all here today. Please read it and get familiar with the concepts and therefore you can enjoy the week-to-week materials here as the games start coming fast and furious. 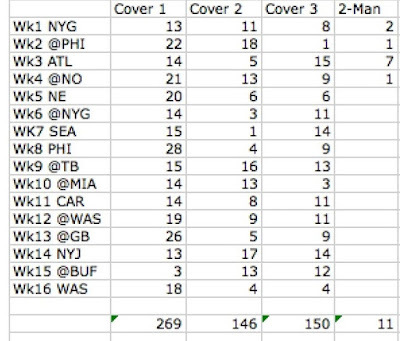 But, in short, here were our findings on what coverages the Cowboys were running. Hint: There was very little Cover 2 and even less Tampa-2. So if anyone tries to tell you that Marinelli has the Cowboys in Tampa-2, you know that they aren't actually watching the Cowboys play. When you follow the defense, you are following some trends. But, you are also trying to identify weak and strong links. This is why I have been following "splash plays" for several seasons now. They are the same concept as the helmet awards have been in the college ranks, as we try to track those players on defense that do something on a given play to make a real, tangible difference in stopping a play, and by extension, a drive. What is a splash play? I tried to define it a while back as the following: A sack, a pressure that forces a bad throw, and big hit on the QB, and a batted ball that may lead to an interception opportunity. Again, you can see how this leads to subjectivity, but a subjective breakdown is better than no breakdown at all. In addition, a splash play will include tackles for loss, a big hit for a short gain, or a stop which is an open field tackle where a player is pulled down on 3rd down short of the marker because of an exceptional effort from a defender. A player who makes the opponent commit a holding penalty is a splash. An interception is clearly a splash play, but so is a defended pass that required a great effort. A major hit in the secondary could be a splash play, but I believe that the outcome of the play will determine that. Sorry, defensive backs, but standing over a guy who just caught a 15 yard pass because you think you hit him hard will not generally pass the test on this blog. So, stop doing it. So, roughly 15 splashes a game is the average that are accumulated. Then, from an individual perspective, here are the 5 winners of the annual honor for most splashes, with their total, and then their "Plays Per Splash" number. DeMarcus Ware is still the career leader, despite having been gone for 2 seasons. Only Sean Lee, Barry Church, and Orlando Scandrick have been on the team the whole time of this study, but all of them have missed time (an entire season) with significant injury. 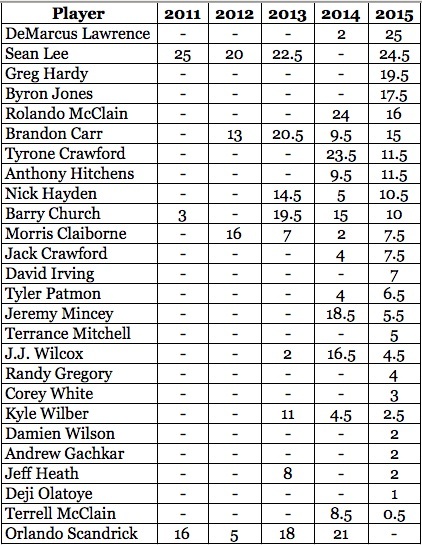 The following list makes up the splash-play standings from the 2015 defense and includes any accomplishments any of those players have had in prior seasons in Dallas. And, finally, if you really like to see it broken down, you may observe each and every splash by designation in the matrix below. If you click on it, it will become far easier to read. So, when you add that all up, blitz rates, personnel groupings, coverages, and splash plays, you have the basis for what we do every Wednesday. Sprinkle in some film study and you will be ready to go when the first report drops in seven days time. Ask any questions below or on Twitter, and you are now prepared for Week 1.